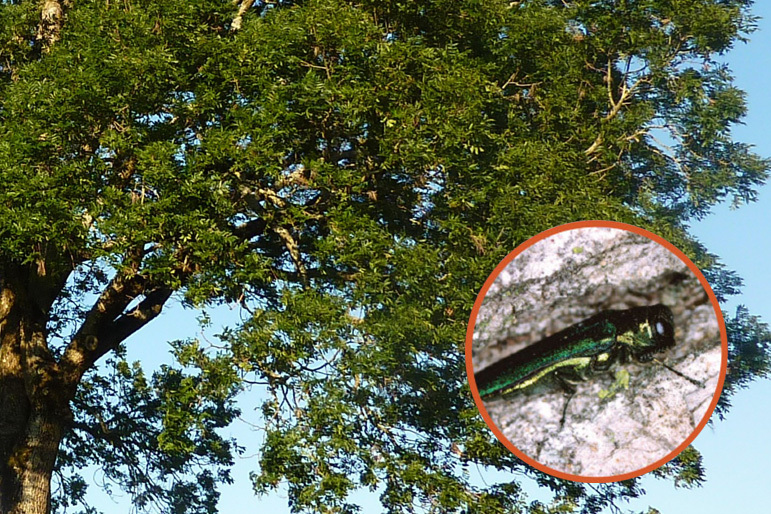 The voracious pest emerald ash borer spotted in Philly | John B Ward Co. The emerald ash borer, a half-inch-long, jewel-green insect that has destroyed more than 100 million ash trees in North America since first appearing in 2002 in Detroit, has officially arrived in Philadelphia. In May, Parks and Recreation officials set out traps baited with pheromones in West Philadelphia, along Cobbs Creek; and in the Northeast, along Pennypack Creek and Tacony Creek. In mid-June two traps in the Northeast Philadelphia neighborhoods of Bustleton and Holme Circle caught several insects, which were sent to the state Department of Agriculture for confirmation. The bad news came late June: The invasive species, which officials had warned over the years would someday reach the city, had finally arrived. Specifically, it had landed in Fox Chase Farm and in Pennypack Park near Welsh Road. "We suspected that the ash borers have been in the city for a while, but this is the first physical proof found," Curtis Helm, project manager for the Parks and Recreation Department's urban forestry and ecosystem management division, said Wednesday. Unless steps are taken, the city will lose a majority of its ash trees in the next five to 10 years, Helm said. More than 200,000 of Philadelphia's 3.1 million trees are ashes, including 600 on city streets. Arborists called the insect's progression a "tidal wave." One moment, a community's ash trees are healthy. The next year, they are dead, said Shannon Herbst, a mid-Atlantic arborist at Rainbow Treecare Scientific Advancements, a Minnesota-based company that provides training and consultation for other arborists. The emerald ash borer, a beetle native to east Asia, is deadly to ash trees. It lays its eggs high in the bark, and the resulting larvae slowly starve the tree by disrupting the upward flow of water and nutrients. Because damage to the host tree starts at the top, by the time anyone notices, the tree usually has been weakened beyond recovery. Mark Faulkenberry, section chief in the forest health division of the state Bureau of Forestry, said Philadelphia has been leading the charge on preventative measures against the emerald ash borer. After the species was confirmed in Warrington in 2012, and later in Horsham, city officials began taking steps to deal with the pest, including mapping the location of all ash trees in the city. The city examined all ashes on public property, inoculated those that were healthy, and removed those that were beyond help. The city has removed 600 trees and treated more than 1,200, Parks and Recreation officials say. Inoculation involves injecting trees with emamectin benzoate, a pesticide that kills the emerald ash borer and its larvae. "We have seen other areas get decimated by this insect, and Philadelphia has excelled at planning ahead," said Donald Eggen, chief of the forest health division. For now, the city has continued its policy of recommending that homeowners take preventive steps. Officials urge residents to locate ash trees on their property and consult an arborist to determine whether they have come under attack. If they have and the trees are still healthy, they should be treated to avoid future damage. But if more than 30 percent of the tree's canopy has been damaged, the tree is beyond help and must be removed, officials and arborists said. Treatment usually costs $10 to $15 per diametric inch, arborists said. So a 20-inch diameter tree would cost more than $200 to treat every few years. Herbst said trees infected by the emerald ash borer must frequently be removed. She recalled an instance in which a homeowner in a Philadelphia suburb "broke down crying" when told that all the property's ash trees had to be removed. Removing a living ash tree is expensive -- residents can expect to pay $1,000 or more. But removing a dead ash often costs more because doing so is riskier. City officials said that if people followed guidelines carefully, Philadelphia could preserve many of its ash trees. "We've known that the ash borers would eventually reach the city," Helm said. "Now it's a matter of everyone working together to save as many ash trees as they can."